I devoured this book. I started it at 9am in the morning and didn't move until I had finished it - yes it was that good! I really, really loved it! I absolutely adored Grace. Her voice was the driving force of this novel and I loved how her story unfolded. I found myself completely immersed in it, desperately wanted to know what had happened but also savouring every moment. Grace is such a complex character and it really works. She's not always the nicest person to those around her but underneath that you really sense 'her' and I just wanted to hug her. Nat and Sal were also great characters. I loved that all three of them weren't perfect - that they all made mistakes. It made it more honest and real, and something I could completely invest in. I loved the whole mystery aspect as well. Who was Ethan? Why was she there? But also in the story Grace tells. You know something must have happened because of the place she was in at the beginning of the story - she tells you that much - but you don't know what happened. I really enjoyed the pace at which we found out all the details - and what they were. There is something very honest about it - it all makes sense in retrospect and everything just falls into place. Not everything in this novel is answered. As the reader we are left to make up our own minds about certain things and I found that really refreshing. I still find myself thinking about Grace and I read Entangled weeks ago. I just can't seem to get her out of my head. 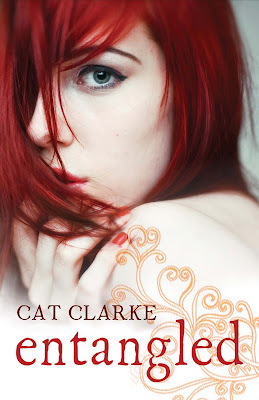 I can honestly say I can't wait to read whatever Cat Clarke writes next! An awesome debut! I love books with secrets as they're so much fun to read. This book has me all sorts of curious. Wonderful review, Sammee. I love this book, and I completely agree about how honest it is. I found this book so emotional and powerful. I kept second guessing what would happen next too. Great review Sammee. I loved this book, as I was reading I thought I had all the answers....but no. They way Grace was made to remember the past and confront supressed memories made me want to know more. I liked the way the reader was the one to decide Grace's fate at the end.